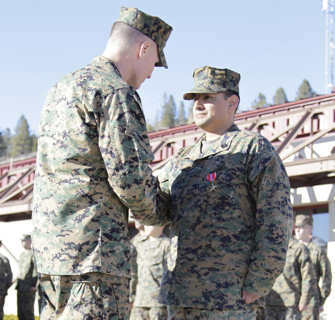 Marine Corps Mountain Warfare Training Center Bridgeport, Calif. (MCN - 2/4/2011) — Established in 1944, the Bronze Star Medal is awarded to United States military members who set themselves apart by heroic acts in combat or meritorious achievements, not involving aerial flight. Master Sgt. Luis A. Carrillo shakes hands with Col. Phillip Chandler, the commanding officer of Marine Corps Mountain Warfare Training Center Bridgeport, after receiving a Bronze Star Medal for heroic combat service in Afghanistan Feb. 1, 2011, at the centers command post. Gunnery Sgt. 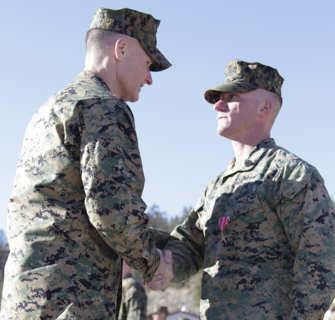 Matthew Nagel shakes hands with Col. Phillip Chandler, the commanding officer of Marine Corps Mountain Warfare Training Center Bridgeport, after receiving a Bronze Star Medal for meritorious achievement and combat service in Afghanistan, during an award ceremony Feb. 1, 2011, at the Center's command post. Master Sgt. Luis A. Carrillo and Gunnery Sgt. Matthew Nagel, two Marines aboard the Marine Corps Mountain Warfare Training Center, distinguished themselves with their heroism and meritorious achievements in combat situations. They were recognized Feb. 1, 2011, for their services and were each presented with the Bronze Star Medal. Nagel was recognized for meritorious achievement for his actions during more than a year of combat service as a staff sergeant in Afghanistan from April 1, 2009 to April 23, 2010. He acted as a company advisor in Embedded Training Team 4-5 for multiple Afghan National Army companies. Nagel led them on more than 50 combat patrols, aided in the discovery of multiple improvised explosive devices and the detainment of eight insurgents. He was involved in two enemy engagement situations where he directed Afghan National Army fire, at times, exposing himself to enemy fire while maneuvering with the Afghan soldiers and directing their fire, eliminating the enemy threat. Nagel's total effectiveness, forceful leadership and loyal devotion to duty reflected great credit upon him, the citation stated. Carrillo was recognized for his heroism in combat while serving in ETT 7-5, while in support of Operation Enduring Freedom. fire while exposing himself to Taliban fire. With word of two casualties, Carrillo rushed to their aid with a corpsman and discovered one soldier was severely wounded. While Carrillo led the litter team through enemy fire, the soldier stopped breathing and no pulse was detected. Carrillo provided chest compressions, revived the soldier and stayed with him until he was medically evacuated via helicopter. Carrillo's forceful leadership and tactical expertise were instrumental in the overall success of 3rd Kandak, 2nd Brigade, Afghan National Army, the citation stated.